Introducing the Touch Loops Vintage Drum Breaks collection. 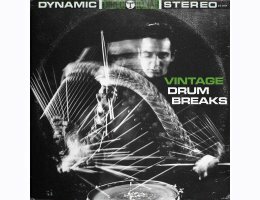 A truly authentic collection of classic break inspired live drum loops and one shots. Harnessing the incredible talents of session musician Timmy Rickard, his incredible performance, analogue heavy recording chain and stunning attention to detail. Touch Loops create one of the most authentic live drum sample packs available today. This is the perfect opportunity to add the feel and swing of live Hip-Hop drums to your next composition. After hours of testing, recording and mixing Touch Loops finally settled on a variety of favourite tones and drum combinations ensuring the final collection had the most vibe, saturation and flexibility. Nestled inside you’ll find the exact tones that have become a staple for artists like BADBADNOTGOOD, Madlib, J Dilla & Alfa Mist. Think classic 60’s mono hip-hop beats, saturated spring heavy classic breaks, tape machine driven one shots and more classic drum loops than you could ever imagine. The loops also include a beautiful collection of off-kilter drum fills, analogue saturated vintage one shots and inspiration guaranteed.